Just a couple of things to do in Montagu, definitely not to be missed! This trip has become a legend since 1985 as a tourist attraction in South Africa and is a popular event for offshore tourists. 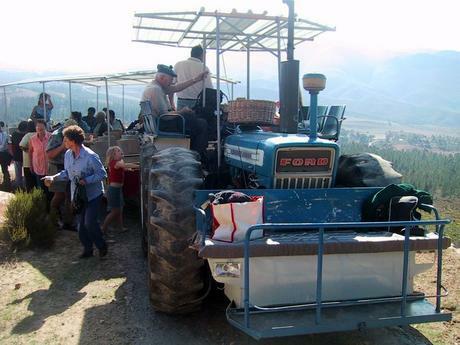 The tractor/trailer takes you to the summit of the mountain range and after a brief stop at the summit (where muskadel is served), a typical farmhouse potjiekos lunch awaits at the end of this 3-hour excursion. Tractor: R50 per adult for the ride, R25 per high school child, R20 for primary and pre-primary children. Potjiekos: R50 per adult, R30 per high school child, R20 per primary school child, R10 per pre-primary school child over 4 years of age. The tractor rides are on Wednesdays and Saturdays at 10am and 2pm. Group bookings are welcome. The annual Montagu Rose show takes place on 22 and 23 October 2004 and is a must for all lovers of roses. It is a competition for all ages and in different categories of flower and arrangements. The main competition will be held on the 22th of October and the exhibition will be open to the public during the afternoon of the 22th and for the whole day of the 23th. It will take place at the Montagu Country Hotel in Montagu. For further details or if you wish to take part in the competition, please contact Magdeld van der Westhuizen on +27 23 614 1981.